AKA <em>FHM.com.ph's</em> actual&nbsp;Facebook&nbsp;chatbox during the senator's momentous declaration. And just like with every other potential 2016 candidate, her announcement was under the watchful eyes of every media outlet, including yours truly. 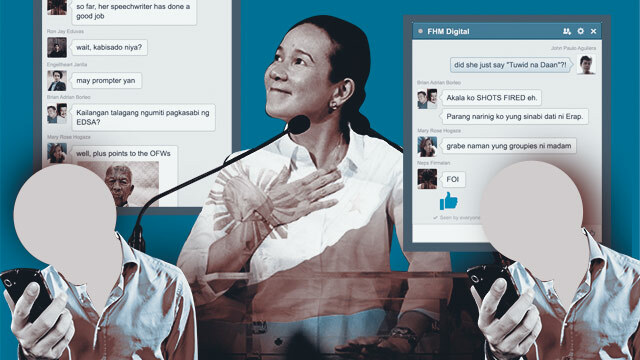 This time though, instead of putting up the usual social media reaction piece (like the one we did on Davao City Mayor Rodrigo Duterte), we decided to share with you our editorial staff's actual Facebook chatbox during Sen. Grace's declaration. In other words, a casual conversation between—or rather, a piece of mind of—FHM.com.ph editors while the event was happening. Ron Jay - asan si Lovi? Ron Jay - "...ipagpatuloy ang mga simulain ni FPJ"? meron ba? BA - What did you expect? Rose - pati si Ms. Susan naka-aquamarine din?! Ron Jay - wait, kabisado niya? BA - Kailangan talagang ngumiti pagkasabi ng EDSA? BA - "mahirap"? Erap all over again? Neps - hooray for e-books! Disney Gone Wild: Artist Draws Popular Disney Princesses As Racy Pin-Up Girls!